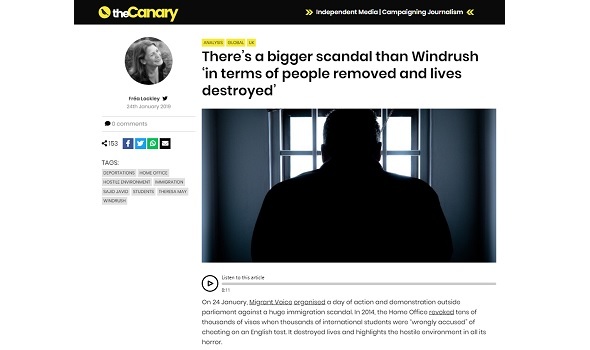 On 24 January, the day when we and some of the students affected by the Home Office's wrongful allegations of cheating held a demonstration and event at Parliament calling for justice, The Canary published a story delving into the scandal. Journalist Frea Lockley spoke to two students affected and to Stephen Timms MP, who has been an advocate for the student at Parliament for several years. One student was studying Law when he had his right to stay in the UK taken away. "I always saw myself standing in court fighting for someone else," he said. "But at the moment I'm standing on the other side, yet I'm not a criminal. Everything I studied in law - that you're innocent until proven guilty - that's not applicable to us. We're told we're guilty without proving it." Mohammad Mohibullah won his Judicial Review in 2016, but still can't restart his studies as he's only been given short-term visas. "It’s not only about me, it’s about other people going through this situation," he said. "What about the students who didn’t have the chance to go to court? I’m really concerned what will happen to them?"